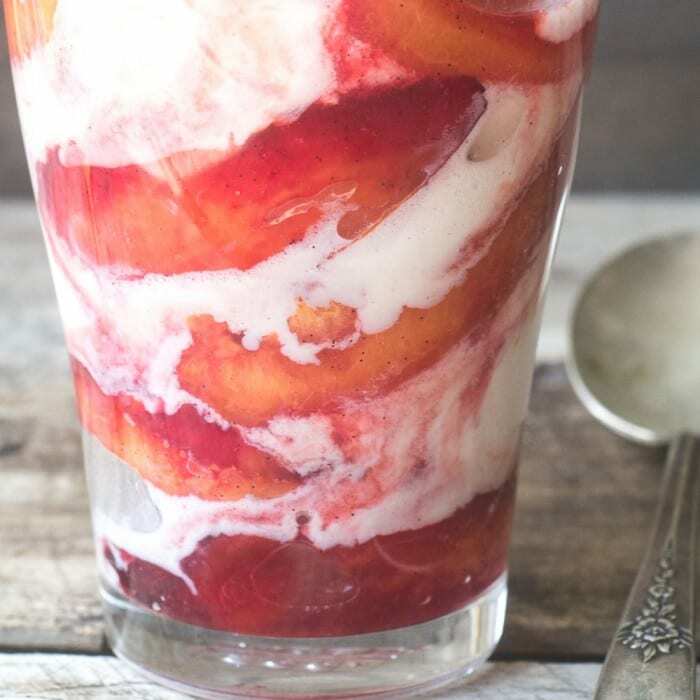 Roasted Plums with Ice Cream is a simple summer fruit dessert with a sly secret ~ you can use that rock hard fruit that shows up in markets way before it’s actually ripe ~ roasting brings out all of the lusciousness, and nobody’ll be the wiser. 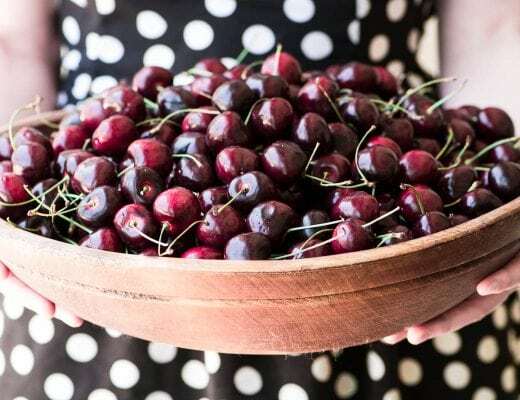 We always want what we can’t have, and juicy ripe stone fruit is one of those things I start craving waaaaay before the mid to late summer when it’s truly in season. I found my plums this week at the supermarket, they’re from Chile. If I tried to let them ripen on the counter they’d rot before anything wonderful would happen. The only way to draw the lusciousness out of them is to roast them in a very hot oven. I tossed them with a touch of sugar, a little lemon juice, vanilla bean, and bourbon. And let me tell you, it not only works, it transforms them into something extraordinary, and then some. 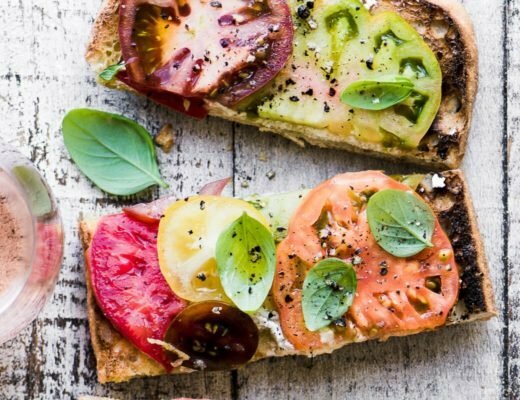 The texture, the flavor, the color — oh my! 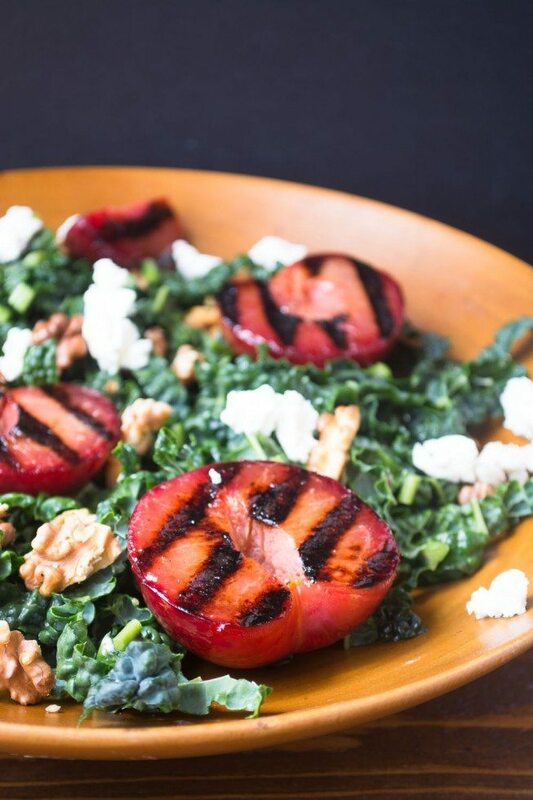 The ice cream is optional, and I’m not just saying that, these roasted plums are absolutely worth it all by themselves, and if you’re trying to cut calories, then that’s the way to go. I always keep a bottle of good bourbon in the house because I love to cook with it, the mellow flavor is the perfect boost for so many recipes. You can substitute all kinds of other spirits if you like, (Amaretto would be nice) or leave it out entirely. As for the vanilla, I’m partial to my Vanilla Bean Paste. I love it because it has a deeper flavor than regular vanilla extract and it contains all those wonderful seeds. It’s more expensive than extract, but much less expensive than using vanilla beans. It’s amazing what roasting and that tiny bit of flavoring does to fruit, these roasted plums with ice cream were spectacular, I hope you give it a try. This is inspired by Jamie Oliver from his Meals in Minutes cookbook. Halve and pit the plums. If the pits don't come out easily, use a small spoon to gouge them out. If the fruit is large, cut it into quarters. Toss with the sugar, bourbon, lemon juice, and vanilla and put it in a baking pan just large enough to allow them to form a single layer. Roast for about 20 minutes, tossing once or twice, until they become bubbly, soft, and juicy. Remove and let cool slightly before layering into small bowls or glasses with the ice cream. Please don’t peel your fruit, the skin adds lots of color and flavor. 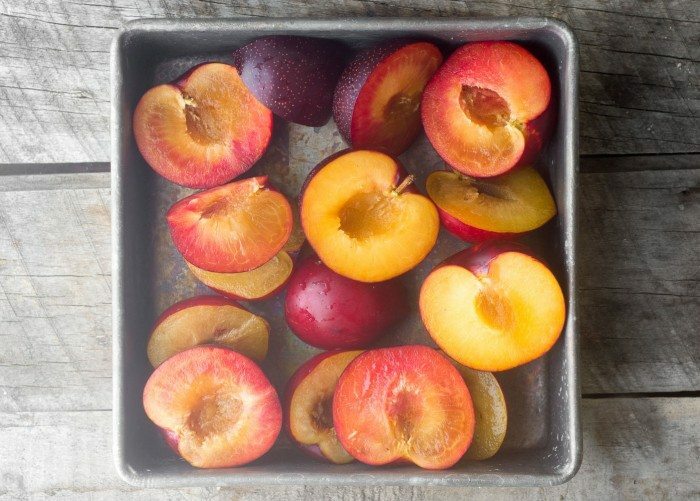 Your roasting pan should be large enough to fit the plums in a single layer, but not so big that the fruit is all spread out, because the juices will evaporate too quickly in that case. You can use the fruit hot from the oven, or let it cool down. 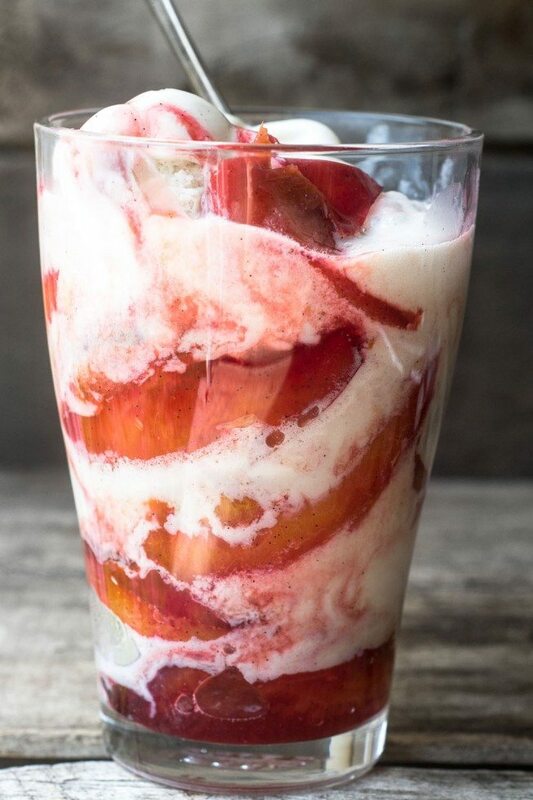 I personally like a little bit of warmth left in the fruit, that way it immediately melts some of the ice cream and everything swirls together into a sea of deliciousness…don’t waste a bit of that juice, spoon any extra over the top. Leftover fruit can be added to your morning yogurt or oatmeal. 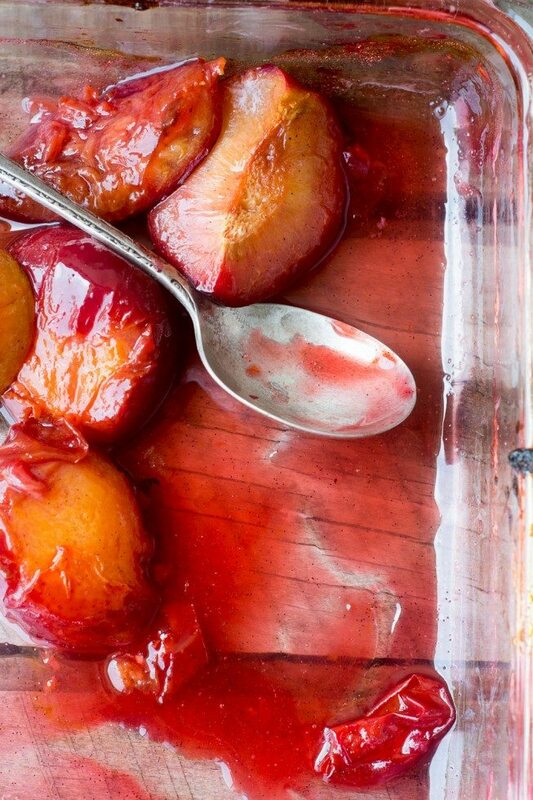 Don’t forget to pin these Roasted Plums with Ice Cream! I’m drooling!! I have a bag of rock-hard plums from the supermarket…and the ingredients to make some vanilla ice cream. So excited to make this! Who would have thought we could get so excited about rock hard plums! Roasting fruit is my favorite way to enjoy them, especially w ice cream! Gorgeous! I’ve roasted peaches, when they’re just too rock hard to work with. Every year, I miss the short Italian prunes season, but I’m going to circle Fall on my calendar. In the meantime, these plums are easier to find. Looks so good. Simple and delicious, and that’s how I like my desserts. 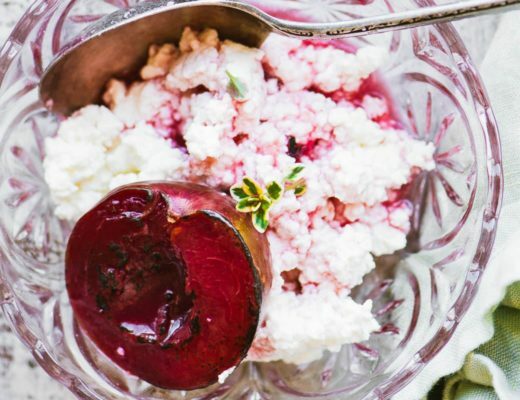 Those roasted plums are just gorgeous, what an incredible dessert! Goodness this is totally drool-worthy! 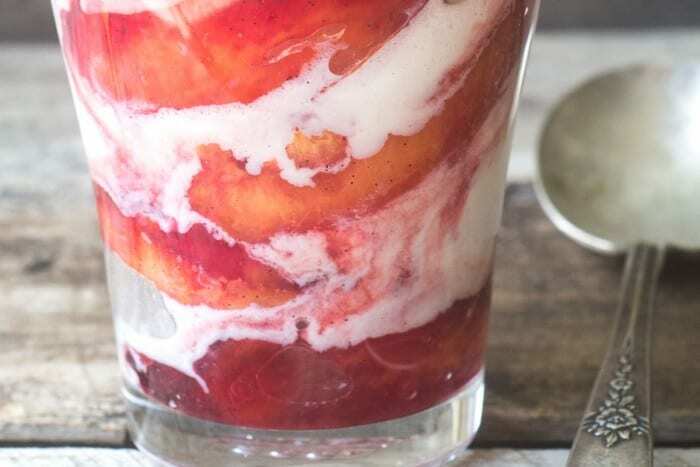 I’m partial to a good bourbon so combined with roasted fruit and ice cream this sounds incredible! It is absolutely beautiful too. Now I’ll be looking for stone fruit this weekend! It’s a good way to get a head start on summer, and that’s always nice. I have a feeling this could be a great bbq dessert too! Thanks for sharing the advice! Absolutely, and you could grill the fruit rather than roast it! This sounds amazing! 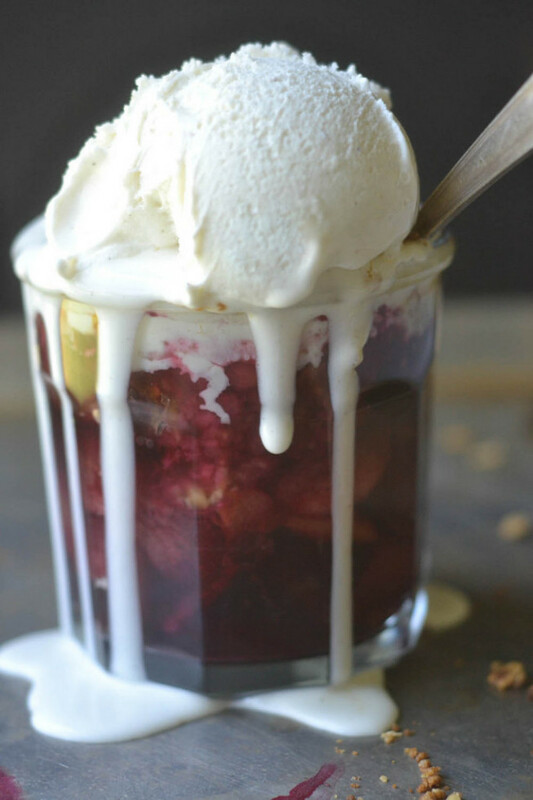 I love roasted plum sauce and with ice cream it’s perfect! Oh my gosh, I’m going to go back to the store and buy those rock hard plums I saw. Thanks a million for this post. I think if you do use frozen fruit, Kathy, it won’t roast in quite the same way, it will be a bit more watery and soft, but should be ok. Let us know how it works! What a wonderful idea Sue. I always rush pass those fruits by at this time of year but I’ll linger and fill a bag next time I see them! What a gorgeous color transformation! Thanks Chris, and it’s the skin that creates that crazy color! Ohhhhhh, that swirly-yummy-dessert is really pretty. I LOVE roasted plums (and plum jam) and wish I could find GOOD ones here. My grandparents had a massive tree in their backyard. They used to send my brother and me up there to pic – and then my Nana would make jam for daaaayyyys. This dessert looks exquisite! It is on my list of things to make this weekend! Beautiful dessert and love the idea of using less than perfect fruit to make something wonderful! Thanks Jennifer — I like the idea because I don’t know about where you are, but even here in Los Angeles it seems like the stone fruit is rock hard right up until August.